It's not just a marker … but a printer, too - even on wood! 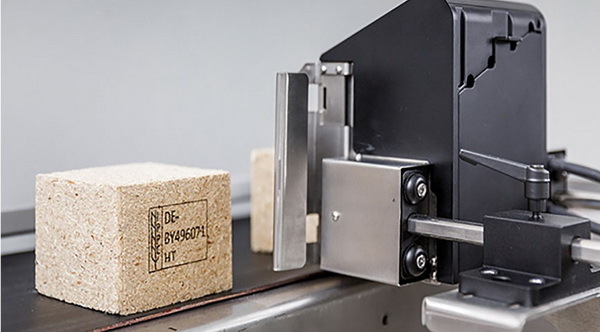 Elried Markierungssysteme GmbH is bringing its new TM1000 inkjet wood marker to LIGNA - for adding a range of data such as IPPC, CE or company logos. Elisabeth Riedmaier's decision to found Elried Markierungssysteme GmbH in 1959 was more unusual for a woman than we could ever imagine these days. Her courage certainly paid off, though, and she made her mark as a pioneer in this male-dominated sector. Elried has stayed in family ownership since that time and is now in the hands of the third generation. Based in Oberhaching, Bavaria, the company currently primarily operates two business units - marking & export coding and product & package coding. The latter, in particular, calls for special inkjet systems - and that is precisely what the Elried stand at this year's LIGNA in Hannover is focusing on. The TM1000 is taking center stage - a new inkjet marking system for applying various data such as IPPC, CE or company logos to wood. Equipped with special cartridge technology, the TM1000 prints high-resolution texts and graphics (300 dpi) with a printing height of 25 or 50 mm and, thanks to a broad range of inks the company has developed in-house, it can do so on both absorbent surfaces, such as cardboard or wood, and non-absorbent substrates such as plastic or metal. Its extremely sturdy construction makes the TM1000 ideal for use in harsh environments, such as those in wood production, where it offers maximum reliability while remaining 100 percent maintenance-free. Until now, Additive Manufacturing processes and 3D Printing have focused mainly on the manufacture of geometrically complex, mechanical components made of plastic, metal or ceramic. Rapid.Techs new Electronic Engineering trade forum will for the first time showcase and discuss 3D Printing of electronic components and conductor tracks on any substrate. Additive Manufacturing (AM) and 3D Printing make it possible to manufacture complex geometries that cannot be produced with conventional technology, and to integrate different mechanical and thermodynamic functions into components during the development phase. This is why they are among the key technologies for turning global trends such as Industry 4.0, ongoing digitalisation, sustainability and individualisation into reality. AM is already established as a manufacturing technology for mechanical series production components in fields such as aviation and medical technology. The inaugural Electronic Engineering trade forum at this years Rapid.Tech in Erfurt from 14 to 16 June will go one step further with its high-calibre speakers. Taking place on the third day of the event, it will illustrate current and future developments of the 3D Printing of electronic components and conductor tracks for parts manufactured using AM. In the first presentation, Robin A. Kruger from LPKF Laser & Electronics AG will give an overview of the most important technologies for the production of MIDs (mechatronic integrated devices). He will also look in detail at laser direct structuring (LDS) and will introduce various LDS-MIDs that have already been produced, taking examples from the consumer electronics, automotive and research sectors. Finally, Kruger will present approaches to combining LDS processes with AM technologies, such as fused deposition modelling (FDM) and selective laser sintering (SLS). Dr Martin Hedges from Neotech AMT GmbH will use his talk to illustrate the current state of technology for integrating electronic functions in 3D printed substrates, which will to enable electronic systems and components to be manufactured entirely by means of 3D Printing. His presentation will include a solution for 3D Printing of complex formed electronic circuits, antennae, heat sensors and other sensors. It will conclude by providing information on current applications, process scalability and large-scale production. Michael Bisges from Plasma Innovations GmbH will introduce digital direct metallisation as a new approach for circuit boards. This process uses digital design data to enable electrical circuits and conductor tracks to be applied directly and inline to the surface of virtually any material. Aarief Syed-Khaja, Chair of Manufacturing Automation and Production Systems Technology at the University of Erlangen-Nurnberg, will report on an innovative approach to manufacturing ceramic circuit carriers for high temperature electronics using selective laser melting (SLM). What happens when 3D Printing and conductive inks converge? This is the question that will be addressed by Simon Fried from Nano Dimension (Israel). He will also give a forward-looking presentation on how 3D Printing in electronics is likely to develop in future years and which parameters will be essential for growth. Presentations at the new Electroni Engineering trade forum, like all lectures at the Rapid.Tech conference, will be simultaneously interpreted (German<>English). The forum is conceived and organised by Professor Jörg Franke, Head of the Department of Manufacturing Automation and Production Systems at the University of Erlangen. The departments research focuses on manufacturing, assembly and 3D Printing of mechatronic products. The member of Rapid.Techs advisory board is, among others, speaker of the DFG Research Group for Optical Interconnection Technology (3D Printing of optical functions). The 13th Rapid.Tech international trade show and conference for Additive Manufacturing is also hosting the trade forums Additive Contract Manufacturing, 3D Metal Printing and Automotive Industry for the first time. The new conference areas, in addition to the well-established trade forums Medical Technology, Dental Technology, Design, Aviation, Tools and Science and the User's Conferences, will provide opportunities for intensive professional exchange on specific AM topics. For twelve years, the specialist conference has been the platform used by experts and newcomers to discuss the current state of Additive Manufacturing as well as developing trends. With the expanded conference programme and the extended, three-day duration of Rapid.Tech, we are keeping abreast of the latest developments in Additive Manufacturing and 3D Printing,explained Wieland Kniffka, CEO of Messe Erfurt. Thanks to its unique combination of trade show and specialist conference, Rapid.Tech in Erfurt is among the worlds foremost events in the field of Additive Manufacturing and 3D Printing. For the fourth time FabCon 3.D, Germanys 3D Printing fair for semi-professional users and prosumers, will be held in parallel with the event. September 12, 2016 --- NUM has launched an advanced control solution for CNC milling machines that features a highly intuitive conversational style user interface. Known as NUMmill, the CNC hardware and software provides a fully scalable control system and is supplied as a complete off-the-shelf package. Based on NUMs market-leading Flexium+ modular CNC platform, NUMmill is typically configured with 3 or 4 linear axes and a single rotary axis, though it easily scales to suit any size and type of milling machine application. All motorised axes are equipped with high performance brushless servo motors, controlled by NUMs latest-generation NUMDrive X digital servo drives. The NUMmill software features an exceptionally easy to understand graphical user interface which employs an interactive, conversational style dialogue to radically simplify machine operation. In fact, it is so simple to use that end-users can operate machines without any prior knowledge of ISO code programming techniques. NUMmill is supplied as a complete, ready-to-run package that includes the Flexium+ CNC system, software, and a 19-inch touch-sensitive machine control panel, together with all necessary drives and motors. The system is also equipped with NUMs MTConnect interface, which simplifies the integration of CNC machine tools with third party manufacturing software. The Flexium+ architecture also offers machine designers, builders and retrofitters an easy means of implementing functional safety. Available as a build-to-order option for all Flexium+ CNC systems, NUMSafe includes a safety PLC, safety input and output (I/O) modules, digital servo drives with built-in safe motion monitoring facilities, and compatible brushless servo motors. NUMSafe is a system-wide architecture that puts functional safety features precisely where they are needed, thereby reducing the number of components and wiring, which simplifies design and most importantly saves time in implementing safe motion functions. 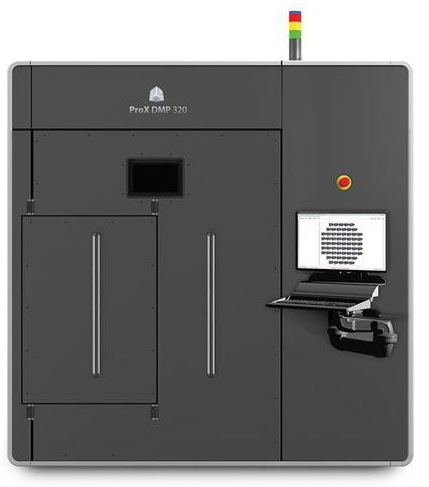 ROCK HILL, South Carolina, January 4, 2016 - 3D Systems (NYSE:DDD) announced today the immediate commercial availability of the ProX™ DMP 320, the latest addition to the company's line of direct metal 3D printers. The ProX DMP 320 is designed for high precision, high throughput direct metal printing and optimized for critical applications requiring complex, chemically-pure titanium, stainless steel or nickel super alloy parts. "As beta system partners, we have been relying on the ProX DMP 320 to make titanium parts and are impressed by the high throughput, ease of use, consistency of output, and overall part quality," said Bob Markley, Founder and Chief Executive Officer at 3rd Dimension, an industry leading Direct Metal Printing provider in North America. "Combined with our ProX 200 and ProX 300, we are able to provide our customers with the optimal part, in the optimal metal, to meet the demands of each and every application - no matter how specialized." The ProX DMP 320 will be on display January 6-9, 2016, in the 3D Systems booth (#72721, Sands Expo) at International CES 2016, Las Vegas, NV. For more details regarding 3D Systems' announcements at International CES 2016, please visit http://www.3dsystems.com/ces.